Introducing Revlon Kiss Cushion Lip Tint, a lip tint inspired by the Korean Beauty trend of popsicle lips. The newest addition to the Revlon lip line delivers a juicy wash of buildable colour that leaves lips appearing fuller, more supple and conditioned, to ensure you always look and feel your best. Available in ten luscious shades, this unique Lip Tint features an innovative pillowy soft cushion tip that feels luxurious on the lips and makes application a breeze. Revlon Kiss Cushion Lip Tint not only makes lips appear fuller and feel conditioned, it protects against dryness making it the perfect companion for summer. My first thought the moment I opened the cap of the Revlon Kiss Cushion Lip Tint was that the cushion tip reminded me of the Lancome Juicy Shakers. The only difference is instead of shaking a bottle to get the product out, you have to twist in order to get the product to come up (similar to those lip gloss twist pens). But be patient with the twisting, the product takes a while to come up (especially if it's the first time opening the product). Once the product is out, it reminded me a lot of the Too Faced Melted Liquified Long Wear Lipsticks in terms of texture, formulation and pigmentation. The Revlon Kiss Cushion Lip Tint is easy to apply, it's hard to make a mistake. Once it's on, my lips feel moisturized, creamy, and smooth. Although it's a tint, it's pigmented and can be buildable to create more of a bold lip colour and less of a tint. The lip tint is not transfer-proof but it stay on throughout the day and kept my lips moisturized. The shade Fancy Rose is very similar to Too Faced Melted Chocolate in Chocolate Honey and I would say it's practically a dupe. There's no flavouring but it has a nice sweet faint vanilla scent, nothing too overpowering. 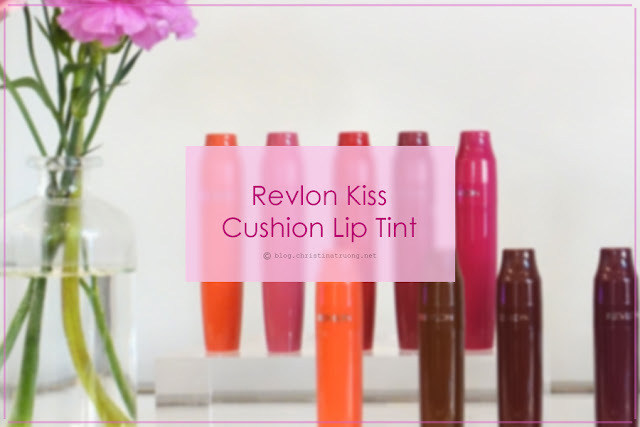 If you're looking for a dupes of Too Faced Melted Lipsticks, Revlon Kiss Cushion Lip Tints are a perfect match! What are your thoughts on Revlon Kiss Cushion Lip Tint? Are you a fan of lip tints? Have you or would you ever try the popsicle lip trend?